Giant industrial wind turbines mean an ignominious slaughter for almost anything on the wing. 50-80m blades, with their tips travelling at over 300 km/h, readily slice and dice birds and bats in their millions every year. Then there’s a smorgasbord of smaller flying critters, like bees, wasps, dragonflies and other environmentally and agriculturally beneficial insects (ie think pollination and predation on the unhelpful species). Of course, from a bug’s eye view their job is to survive as a species, irrespective of whether a farmer’s crop fruits or perishes. But that would be to show concern for the environment, for the environment’s sake. And that has nothing to do with these things. Quite apart from those indirect effects, bees and other insects have a more direct and pressing problem with these things: the blades represent the end of the line. And the carnage is measured in the thousands of tonnes. In Germany, there are currently around 25,000 wind turbines installed. For some years now, it has been known that they do not provide environmentally friendly electricity, as countless birds and bats are killed by their rotor blades. But that is not all. Wind turbines for power generation should actually produce more electricity with increasing wind strength. However, this is exactly what they often do not do, which has confused experts for years. The puzzle could already have been solved in 2001 thanks to a new study: dead insects that stick to wind turbines should be responsible for the low yield. This was reported by a Dutch-Danish team of scientists as early as 2001 in the issue of the British journal Nature: “Insects can halve wind turbine power”, Nature 2001. At low wind speeds, burst insects start to accumulate on the leading edges of the rotor blades, the authors explain. At strong winds, the air flow can be torn off due to the now rough surface – the electricity generated drops rapidly. Such power losses – in some cases up to half – have been noticed, for example, on California wind farms. The reason was unknown until then. However, with specially developed reflectors glued to the rotor blades, experts were able to directly observe the effects of dead insects 20 years ago. Currently, the “great insect dying off” and “bee dying off” is on everyone’s lips. However, neither the Greens, nor the environmental NGOs, nor the Federal Environmental Agency are addressing the insects killed by the rotor blades of wind turbines, let alone field studies are commissioned. The media is also not interested in the topic. However, some scientists have long suspected that insects could be attracted to wind farms due to the color of the rotor blades, the heat given off by the turbines and the flashing lights on the wind turbines. The scientists also know that turbines cause a reduction in wind speed at the hub level and cause turbulence. The turbines cause changes in wind, precipitation, temperature and evaporation. Studies have been able to prove such environmental influences up to 20 km away from a wind farm site. A recent study by the Deutsches Zentrum für Luft- und Raumfahrt (DLR) Interference of Flying Insects and Wind Parks concludes that 24,000 tons of insects per summer could pass through the German wind farms with a total of 25,000 wind turbines. That would be about a ton of insects per wind turbine. 5% of the insects could fall victims to the turbines. So 1,200 tons of insects in total, or 50 kg of insects per wind turbine. The DLR study further concludes that this could be relevant to the survival of insect populations within 15 years, especially for insects flying in the appropriate altitude range between 20-220 meters altitude. This is what most insects do! Regardless, the topic will not be further discussed and silenced. So also last night in the public German TV channel ARD. Yesterday evening, the “great dying off of insects” was discussed at the talk show “Maischberger” in the ARD. The invited guests included, among others, the meteorologist and science journalist Karsten Schwanke (once a doctoral student of climate scientist and climate activist Professor Dr. Hartmut Graßel, who was the inspiration behind the famous cover of the magazine Spiegel that showed the Cologne Cathedral under water in 1986) and the leader of the Green Party in Bavaria Katherina Schulze (nicknamed #KerosinKatha because of her frequent travelling). Another guest was Spiegel author Jan Fleischhauer. Fleischhauer drew Schwanke and Schulze’s attention to the effects of wind turbines on insect populations. They were jolted and asked for the source of that claim. Mr. Fleischhauer answered “google it, then you will find it”. Ms. Schulze argued that one would have to locate wind turbines so that they would not be in the “entry lanes” of bats and other animals and it was long proven that the damages of climate change would be much larger than if nothing would be done about it. Mr. Schwanke agreed to this. Mr. Fleischhauer further pointed out in the discussion that the Greens under minister Trittin had promoted monocultures and thus contributed to the insect killing. Minister of Agriculture Renate Künast argued for the expansion of bioenergy in the face of rising oil prices in 2004. Rapeseed farming could make farmers the “oil sheiks of tomorrow,” Künast said. “The field will become the 21st-century oil well, the farmer will become an energy producer,” minister Trittin announced in November 2005 at the International Biofuels Congress, acclaimed by lobbyists and other beneficiaries. Mrs. Schulze and Mr. Schwanke then both shook their heads in disbelief. Ms. Schulze replied that the expansion of energy maize was not done under the Social Democrat- Green coalition, but under the government of Mrs. Merkel. So they would not bear any responsibility and the mistakes made under Mrs. Merkel must now be corrected. Ms. Schulze suggests that organic farming should be promoted even more; who should pay for it, she could not and did not want to say. In addition, the consequential damage caused by nitrate in the groundwater would be much more expensive than if one did not act now. Mr. Schwanke underpinned this and mentioned sums in the range of one hundred million euros, which are low compared to the approximately 35 billion euros, which the energy transition costs every year. Nevertheless, the expansion of wind power will continue and it is hoped to get the problem of “insect dying off” under control with organic farming. That this will not lead to the desired success, since organic farmers also use pesticides and grow monocultures and people are not willing to pay double the price of their organic foods in the stores, it is incidental and not significant. At least for the green clientele, which is among the wealthier citizens. It is the same here in Canada. The bee population has been impacted severely. But at the same time wind turbines are popping up everywhere. I always thought it was because of the farmers using pesticides that’s killing off the bees. I would have never thought these turbines could also be wipping out different species. Thank you for insite into this problem. Industrial wind turbines create great problems for flying bats and flower seeking bees. -Let me try to explain. Honey bees thrive on the nectar that fields of flowers produce. They send out “scouts” from their hives to find where these flowers are. 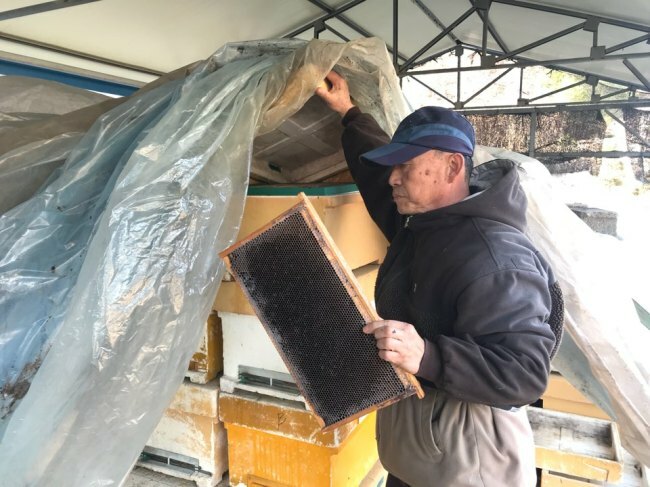 Then the “scout” bees return to the hives, and they perform the “BEE DANCE” on their return to the hives, which involves the vertical movements of these bees and the beating of their wings to produce a buzzing sound at the lower frequencies of sound. Somehow, their fellow bees in the hives can learn the locations of the nectar bearing flowers, and then they can find this nectar for their food. In the process of doing this, they pollinate the flowers, and we can enjoy many of the fruits and vegetables that we eat. 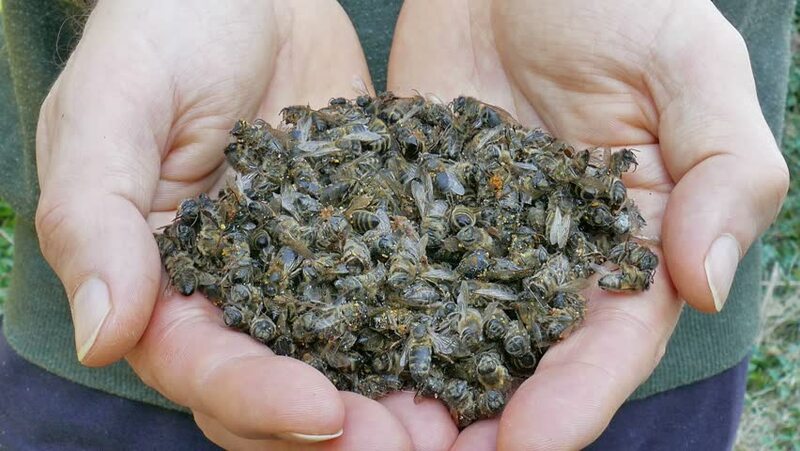 Now, if anything disturbs the vital activities of the “BEE DANCE”, the honey bees will begin to starve, and they will all leave their hives to seek another source of food. IWTs propagate low frequency noise. They can interfere with the communications of honey bees during the “BEE DANCE”. THEY CAN ACCOUNT FOR STARVATION OF HONEY BEES. THEY CAN INTERFERE WITH THE PRODUCTION OF HONEY. THEY CAN SERIOUSLY IMPACT ON POLLINATION. THEY CAN DEPRIVE HUMAN BEINGS OF MANY DELICIOUS FOODS. This is one reason that land based industrial wind turbines are not the best way to produce electrical energy. BATS fly during the evening hours. They employ a natural form of echo-location to find flying insects for their food. Flying insects are attracted to sources of light. Red appearing lights that are mounted atop of IWTs to give aviation a chance to see their presence (FAA rules), are exactly the correct light source that attract many flying insects. Bats are destroyed by impacts with wind turbine blades. Bat eco-location systems are interfered with by IWTs. The pressure waves propagated by the spinning blades of the IWTs causes BAT lungs to implode, thereby killing those bats instantly. Bats have a difficult time surviving the fungal disease, “white nose syndrome”, which kills many species of bats. If the public wishes for the EXTINCTION of the bat, it should promote the proliferation of IWT arrays wherever it can! …BEFORE THEY PLUG THEIR ELECTRICAL DEVICES INTO THE SOCKETS ON THEIR WALLS! Thanks for explaining this. I have been amazed for a while when hearing how concern a about the demise of the bee population has been increasing in different countries and wondered if Turbines had any impact, as it seemed strange this decline in bee populations seems to have appeared with the massive increase inn numbers and size of Industrial Wind turbines, but I didn’t know enough about bees to know what it was that caused the bees problems. Pity all those who proclaim the high ground on wanting to look after the environment don’t think critically about what they are proposing. Our environment is being destroyed by those who chant rhythmically to the ‘pied pipers’ tune instead of heeding the evidence. Those in charge do not care, but RSPB and the like, unless bribed, must complain.